Students who have just graduated from high school may feel a little lost in their new setting, but Goodwin is here to support all students in this unfamiliar process. “We understand that it’s challenging for students, especially when they don’t have family support, but we want to take care of them and guide them,” Lentino stated. Goodwin student Kaleigh Miller is the first person in her extended family to attend college. “I didn’t have the best grades in high school, and my parents weren’t supportive of my going to college, but Goodwin is my second chance. I started a new life here,” Miller said. Goodwin’s Summer Bridge Program, a free program designed to bridge the gap between high school and college, puts students on the path to success in college and beyond. “Some students aren’t engaged after they graduate from high school. This is an opportunity to make sure they are checked in and motivated to attend college in the fall,” said Aaron Isaacs, Director of Educational Opportunity Programs. “Students just need to come with drive, motivation, and the willingness to succeed. All else is covered at no cost. The benefits for 18 to 20 year olds are tremendous at Goodwin,” said Angela Skyers, Assistant Dean of Students. After attending Summer Bridge, students are eligible for the MOVE (Men of Vision and Education) and WISE (Women Invested in Securing an Education) programs. If accepted into these programs, they will receive scholarships that cover 75% of their tuition at Goodwin plus free books each semester. The programs come with myriad support systems and one-on-one guidance. “MOVE and WISE are meant to be engaging and supportive. We meet with students weekly and have team meetings where students get to hear from speakers on a variety of topics,” Isaacs stated. In order to stay in the program, students must maintain a minimum GPA of 2.7, engage in 15 hours of community service per semester, and be active with one of the clubs on campus. “We have completed almost 2,000 hours of community service through MOVE and WISE and are eligible for a Connecticut Community Service Award,” Isaacs noted. Kyle Thompson, a member of the MOVE program, emphasized that he is not just a student for school, but a student for life. “I wasn’t motivated in high school. I didn’t think college was for me, but I enrolled in the MOVE program and gave it one more shot. Goodwin taught me not to give up and not to sit still. I’ve learned to make choices that will be a ‘good win’,” Thompson said. 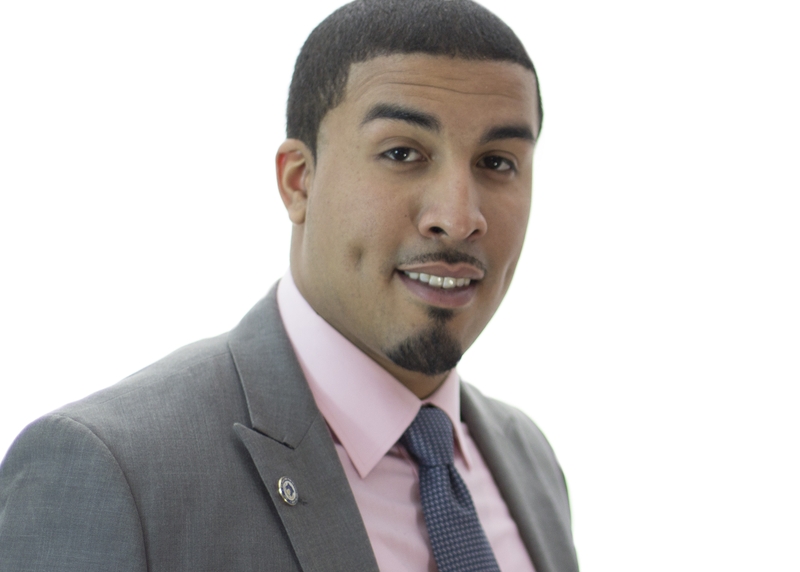 Lester Castro, business student and veteran, described Goodwin as a family. “They call me by my first name. Big schools can be overwhelming. Expenses and partying can get in the way. There are so many opportunities here and I can always find the help I need,” Castro stated. Goodwin hopes to expand on the educational programs offered to add more layers to the fabric of the school. The College committed over $7 million in support for students to start or stay in school last year. For more information on the Summer Bridge Program, click here. For more information on the MOVE and WISE programs, click here. For questions on enrollment, please contact Sue Hogan, Academic Community Liaison, at 727-6739 or SHogan@goodwin.edu. 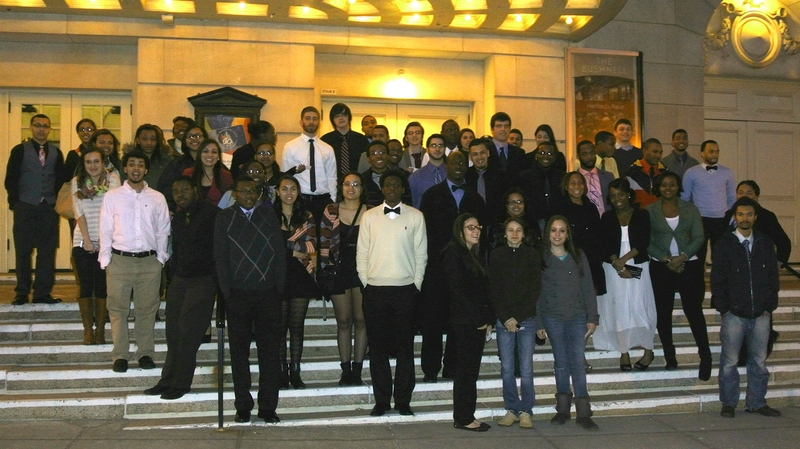 On March 20, students in Goodwin College’s Women Invested in Securing an Education (WISE) and Men of Vision in Education (MOVE) programs participated in a formal dining and theatre experience guided by Goodwin’s Vice President of Advancement, Brooke Penders, and Pratt and Whitney’s Community Relations Director, Heather Summerer. With the help of the facilities team and catering by the Spicy Green Bean, staff members transformed the College’s community room into an exquisite setting for practicing business and dinner etiquette. Students were greeted at the door by the speakers and evaluated on their handshake, eye contact, and introductions. Throughout the dinner, they were guided by tips on appropriate table manners, the function of the place setting, and how to carry on a conversation while eating. The goal was to make sure that students are comfortable in unfamiliar social situations. At the conclusion of dinner, students had a quick tutorial on theater etiquette and were treated to a performance of the national tour of The Book of Mormon at The Bushnell Center for the Performing Arts. The experience provided a unique opportunity for the staff to expose students to different cultural venues. Our goal was to provide students with a chance to practice conversational skills and recognize connecting points when networking. We found it important to make their first performing arts experience fun and entertaining. The whole evening proved memorable for the students and plans are already in motion to attend future performances. We acknowledge and thank our grant funders, the Harford Foundation for Public Giving, the Aurora Women and Girls Foundation, and the Beatrice Fox Auerbach Foundation Fund at the Hartford Foundation for Public Giving, for making this event possible. Educational Opportunity Program (EOP) students prior to the start of the fall semester were given an academic behavioral assessment called Engage©. The intent of the assessment is to look at the psychosocial factors that contribute to success in college. The results are the grouped into three major themes: Motivation and Skill, Social Connectivity, and Self-Regulation and Persistence. During the spring 2014 semester, our focus is on Motivation and Skill. Throughout students’ academic journeys, they will have a multitude of opportunities to enhance their reading, writing, and career skills through the classroom. While this is extremely critical to student academic success, students also need opportunities for experiential learning to enhance their “soft skills” in order to remain competitive in meeting the demands of a highly diverse and skilled work force. Employers no longer base their hiring decisions on immaculate resumes and cover letters; they seek articulate, well-rounded individuals who can represent their companies. Soft skills like travel, dinner etiquette, engaging in meaningful conversation, and access to the performing arts can give students an edge in securing a career. 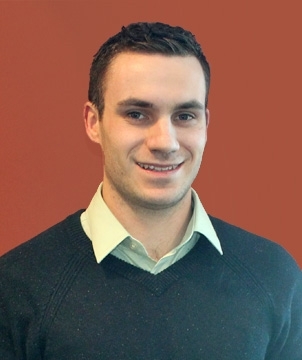 This entry was written by guest blogger Aaron Isaacs, Goodwin College’s Director of Educational Opportunity Programs. A group of 40 Goodwin employees celebrated at Wallingford’s Oakdale Theater on March 19 as the College was officially named to The Hartford Business Journal’s “Best Places to Work in Connecticut” list for 2014. The Goodwin delegation — the largest at the event — represented the College at the awards dinner, which featured the 35 companies and organizations selected for the prestigious HBJ list. 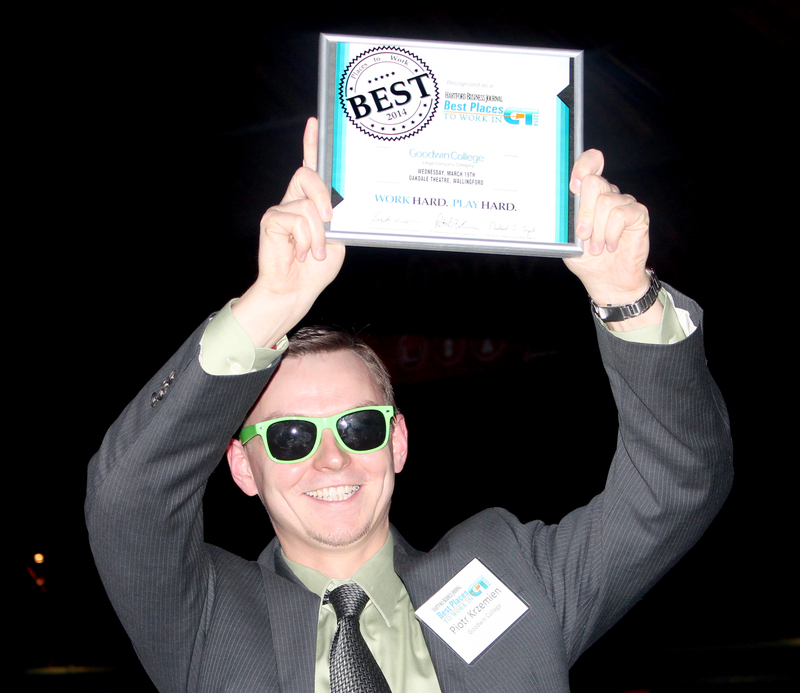 Piotr Krzemien displays Goodwin’s “Best Places to Work” award for 2014. The HBJ publishes a list annually after surveying companies and their employees on a number of criteria. The first part of the survey evaluates company policies, practices, philosophy, systems, and demographics, while the second surveys employees on the working experience and environment. The survey, conducted anonymously, accounts for 75 percent of a company’s overall score. Organizers said that this year’s list was the most competitive in the initiative’s nine-year history. A common factor that set the top companies apart from the rest was employees who feel engaged and connected with their employers. “Being one of the best places to work in Connecticut gives your brand a boost and you will certainly reap the benefits of it,” said Peter Burke, CEO of the Best Companies Group, which coordinates the contest for The Journal. Goodwin College was the only educational institution to make the list. While the entire Goodwin leadership team and a number of trustees attended the dinner, it was Piotr Krzemien of the Information Technology Department who was selected to accept the award. Krzemien donned his now trademark green sunglasses, which became a familiar site to his coworkers during this year’s Employee Giving campaign. Krzemien played a big part in helping raise over $53,000 for the Goodwin College Foundation. The companies who made the list, representing a diverse cross-section of Connecticut’s economy, were grouped according to size. With more than 400 employees, Goodwin joining the other large-sized companies that made the list. Additionally, 10 small and 15 medium companies made the overall list. All the companies were introduced during the award ceremony, which also featured a trivia contest and photo montages of each honoree. Goodwin College President Mark Scheinberg said he was very pleased with Goodwin’s inclusion on the list and offered his congratulations to all the companies who qualified. See online version of the Hartford Business Journal. Write-up on Goodwin College on page 13. 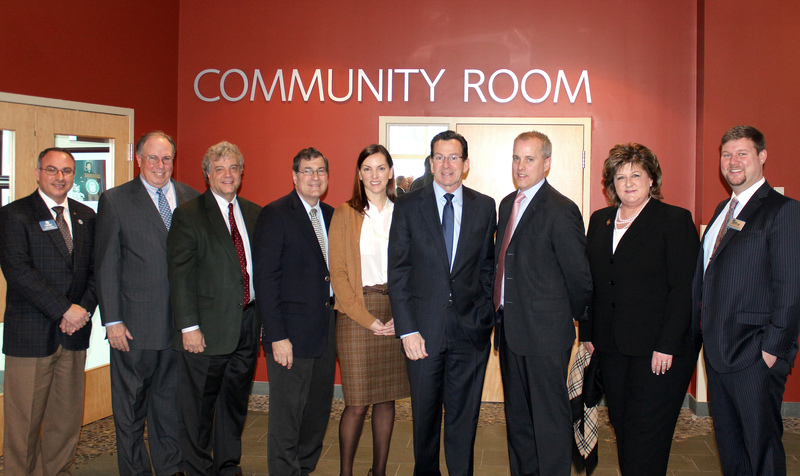 During an East Hartford Chamber of Commerce breakfast held at Goodwin College on Wednesday, March 19, Governor Dannel P. Malloy touted the government’s continuing investment in Connecticut businesses. 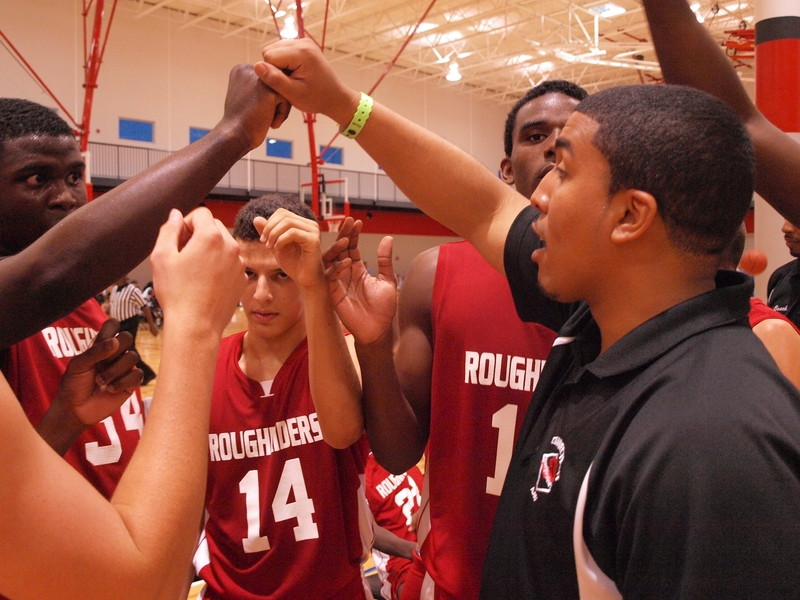 From left to right: Goodwin College Asst. Director of College Relations Guy LaBella, East Hartford Chamber of Commerce President Tim Coppage, Goodwin President Mark Scheinberg, State Senator Gary LeBeau, AT&T Director of External and Legislative Affairs Abigail Jewett, Governor Dannel P. Malloy, AT&T Connecticut President John Emra, East Hartford Mayor Marcia Leclerc, East Hartford Chamber of Commerce Chairperson Joe Bierbaum. Malloy offered insights about the government’s relationship with Connecticut businesses and the return the state is seeing in economic growth. His visit came on the heels of improving employment figures in the state, as well as significant progress slated for East Hartford in the coming years. East Hartford Mayor Marcia Leclerc thanked the governor for the recently announced initiatives that will favorably impact her town’s future, including state plans to partner with United Technologies to expand Pratt & Whitney in East Hartford, as well as other UTC subsidiaries throughout Connecticut. The state legislature needs to approve the incentives, but it has the full backing of the state’s executive branch. Also, developers have recently unveiled plans to develop a massive retail outlet mall at Rentschler Field, which is already home to UConn’s football stadium and Cabela’s. Along with Goodwin College’s continued expansion in East Hartford, the plans for Pratt & Whitney and Rentschler Field stand to strengthen East Hartford’s local economy considerably. UTC and other Connecticut companies were highlighted during Malloy’s speech, as were institutions like Goodwin College who are producing a qualified workforce. “The product we produce that is superior to any other state is our human capital, and we are getting even better at that,” said the governor. Malloy also addressed the role of small businesses and the state’s investment in helping them to succeed. He quoted a statistic that between 2002 and 2009, Connecticut’s government invested in 116 businesses. Since 2010, during Malloy’s administration, the government has invested in 1,600 businesses and companies. While Malloy said the function of job creation largely rests with the businesses, the state has invested in those businesses and suppliers because they will drive the future of the state’s economy. Goodwin College is proud to announce the President’s and Dean’s Lists for the Fall 2013 session. The College saw record numbers of students earn places on each respective list, reserved for those students who perform exceptionally in academics. Placement on the President’s List requires a student to maintain a flawless 4.0 GPA during an academic session in at least six registered credits. During the fall, 247 students achieved the President’s List. The Dean’s List requires students to earn a minimum 3.5 GPA across at least six registered credits. Students earning a place on the President’s List are also included on the Dean’s List, which saw 846 students meet the requirements in the fall. In addition to publishing the lists on the Goodwin College website, the lists were sent to all local newspapers in the state and region. Also, the College created individual Merit Achievement stories that can be posted to students’ social media accounts. President’s List students can claim their Merit Achievement stories here. Dean’s List students can access their stories here. Congratulations to all students who qualified for either or both lists and best of luck in academic sessions to come. NEW BRITAIN – Enthusiasm was mounting in a Central Connecticut State University gymnasium on March 5 when “Hail to the Chief” began to play and President Obama made his entrance. And, as the President made his way to the podium, a contingent of Goodwin College students and staff members were a mere three rows away. 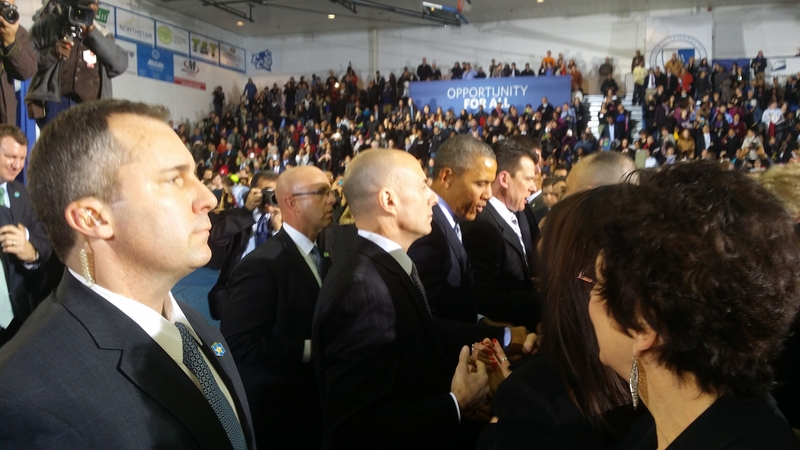 President Obama stops to meet with the crowd at CCSU during his March 5 visit. Photo contributed by State Rep. Robert Sanchez. “It was really good to see how invested people are in what President Obama had to say about important issues like raising the minimum wage and equal pay for women,” said Tianna Ferguson, a Goodwin student aspiring to enter the Nursing program. 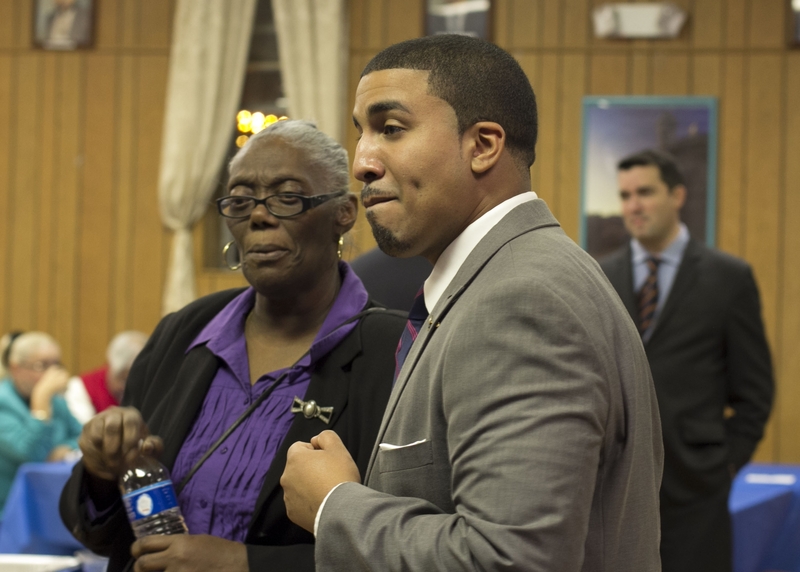 Ferguson, from Enfield, is a prominent member of the Goodwin’s Women Invested in Securing an Education (WISE) program. She waited three hours in the cold for the President to arrive, attending the event along with WISE Coordinator Latanya Kennedy and Americorps VISTA Meghan Gallagher. Congressman John B. Larson, a CCSU grad and resident of East Hartford, provided tickets to Goodwin. Manny Sanchez, a member of the New Britain City Council and Goodwin’s Employer Relations Coordinator, secured prime seating for the contingent for the President’s speech. President Obama was visiting to advocate that the national minimum wage be raised to $10.10. Connecticut, along with states including Massachusetts, Rhode Island, and Vermont, have all recently raised their state minimum wages. 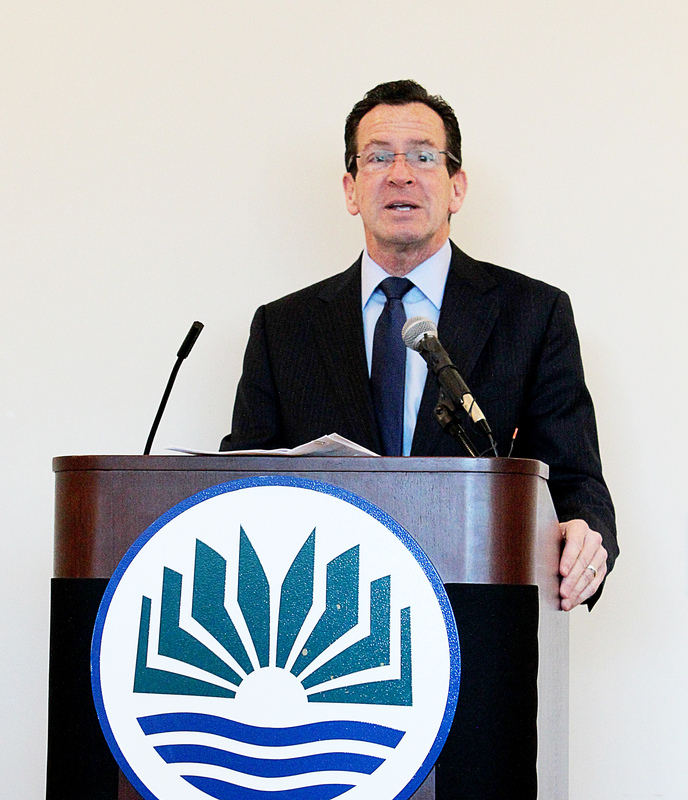 The respective state governors, including Connecticut’s Dan Malloy, support the President’s initiative and joined him at CCSU. In his speech, President Obama delved into the need for quality educational opportunities at all levels, regardless of obstacles that may be in place hindering academic success and job training. “The bottom line though is whether it’s technical training, community college, or four-year university, no young person should be priced out of a higher education,” President Obama said. Gallagher is from upstate New York and was the first in her family to graduate from college. She is spending the next year as an Americorps volunteer working at Goodwin. She was especially inspired by the message that, regardless of background, anyone can succeed. “So many of us understand that at the heart of America, the central premise of this country is the chance to achieve your dreams if you work hard, if you take responsibility; that it doesn’t matter where you start — it’s where you finish,” President Obama said. Ferguson took heart in the President’s push to raise the minimum wage, which she believes would be very beneficial to students. “A higher minimum wage would make paying for college more manageable for many more students,” Ferguson said. The contingent also expressed hope that someday President Obama might make a visit to Goodwin, either during his time in office or afterward. Having experienced a day of Secret Service checks, long lines, and enthusiastic crowds, Gallagher said it would be an honor to host the President on the River Campus. “It would be madness, but it would be worth it,” she said, to the agreement of her contingent. An audience of more than 300 gathered at Goodwin College on February 26 to hear Stew Leonard Jr., president and CEO of Stew Leonard’s, deliver an inspiring, uplifting speech, often laced with humor, at Vital Voices in Entrepreneurship, a speaker series focused on first-hand perspectives from leaders who are making their mark in business and the community. 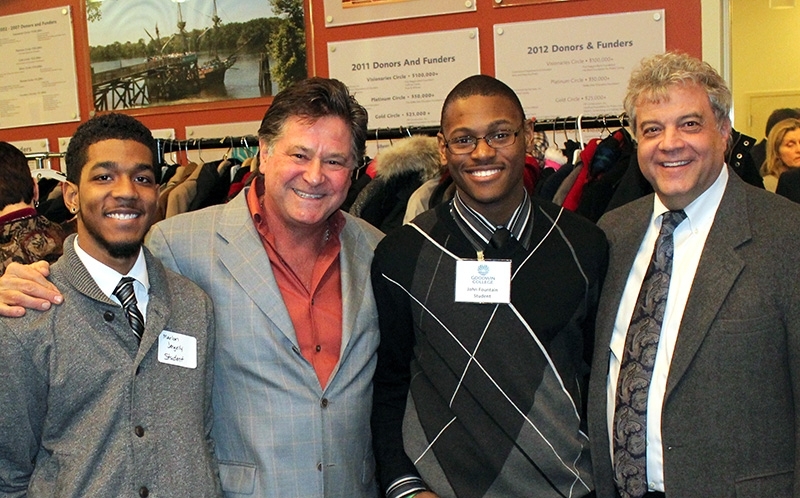 Leonard pictured with Scheinberg and two Goodwin students, Marlon Jengelly and John Fountain. Stew Leonard’s, a unique family owned and operated fresh farm food store, came from humble beginnings in the 1960s, as a milk company — one with a distinctive flair for marketing. During the last 50 years, the company has expanded its products with four farm store locations in Connecticut and New York, as well as nine wine stores in the tri-state area, accounting for more than 20 million visitors annually. Leonard referenced the four main STEW principles of business that he and his family follow: Satisfy, Teamwork, Excellence, and Wow! Satisfying customers and maintaining the philosophy that the customer is always right have proved essential to Stew Leonard’s business plan. Listening to customer needs and providing for them are something the Leonard family insists on. “People want to help local farms, they want organic foods, and they don’t want antibiotics in their food. We get a lot of our products from farmers in Connecticut, and we provide whole, organic foods that customers want,” Leonard noted. The dictionary defines teamwork as a “cooperative effort on the part of a group of persons acting together in the interest of a common cause.” Leonard understands the importance of a healthy working environment. “You can’t make a great place to shop without first making it a great place to work,” he stated. The number of Stew Leonard’s employees is growing at a steady pace with no layoffs in the history of the business. Achievement awards are presented at events to show appreciation for all of their hard work in the common cause of providing quality products. Employees are the key to making a business prosperous. Something is certainly working: Stew Leonard’s has been included in FORTUNE Magazine’s “100 Best Companies to Work For” list for the last 10 consecutive years. “Stew’s business messages are wrapped in honesty and humor. They are simple, clear, and very affective. He understands that his employees make his business what it is,” said Lee Housley, a current student in Goodwin’s Management and Leadership program. When “cronuts” (a cross between a croissant and a donut) became a recent fad, Stew Leonard’s developed their own version, selling over $100,000 worth since August. Another treat, “crogels” (a cross between a croissant and a bagel) have created profits upwards of $50,000 in a just a few weeks of their premiere. Researching, being ahead of the curve, and visiting with farmers to understand where their products are coming from have allowed the company to reap endless benefits. “With competitors like Walmart, Costco’s, Whole Foods, and Trader Joe’s, we can’t just sit back. We are always trying to make the stores better,” Leonard said. The final philosophy — the Wow! Factor — is all about creating a unique, uplifting experience. “We don’t act like a chain. We keep that family feeling alive,” Leonard stated. Stew Leonard’s provides an interactive environment complete with costumed characters for kids, milk containers that sing, and much more. No one who visits a Stew Leonard’s location is likely to forget the experience. As with all businesses, Stew Leonard’s has experienced its share of failure. “The reality of life is that there are bumps and setbacks and you stumble,” Leonard explained, “but you pick yourself back up.” Failure is a part of business and life in general. “[Leonard] embraces the failures as opportunities to be better,” Housley noted. “Triumph through tragedy” seems fitting for Stew Leonard and his success story. In business and in life there are hurdles to overcome, but once crossed they can lead to endless possibilities through effort and hard work. Goodwin thanks the East Hartford Chamber of Commerce for sponsoring the event. In addition, Scheinberg made an announcement that T. Boone Pickens, Texas businessman, philanthropist, and Goodwin College 2013 Honorary Doctorate recipient, will be providing funding for future speaker series at the College called the T.Boone Pickens Endowed Speaker Series – Vital Voices in Education, Innovation and Entrepreneurship. Goodwin College and the Yancy Management Group Inc. of Connecticut are pleased to announce that a partnership between their two organizations has resulted in a generous grant from the Fairfield County Community Foundation. The $10,000 award will support an innovative, peer-based program that will focus on a 2014 series of leadership discussions for school principals and teachers from towns and cities in Fairfield County. 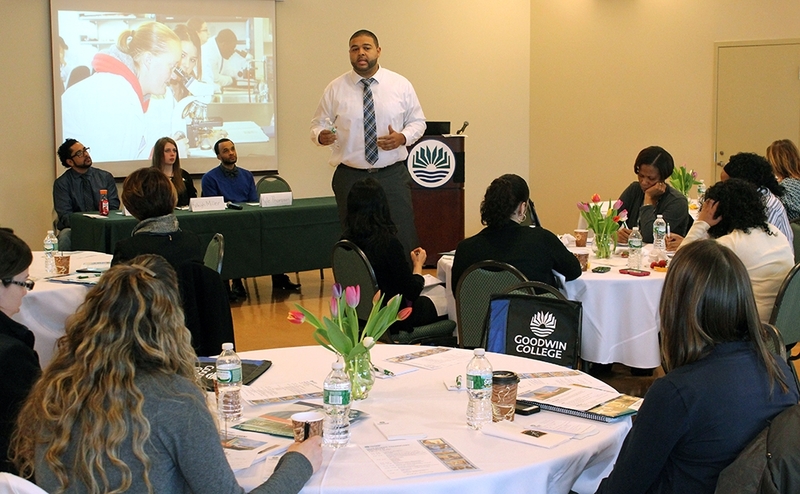 Designed in partnership with the Connecticut State Department of Education, the Forum Educational Leadership Programs (FELP) are a variation of a program first established by Early J. Yancy, head of the Yancy Management Group. In an environment of confidentiality and carefully structured activities, groups of eight to 12 educators moderated by Mr.Yancy will meet to talk candidly about topics important to them, share access to their personal networks, and draw out the collective wisdom of members to use as best suits their needs. The forums are unique in that while they focus on work, they also allow members to share their aspirations. “By re-energizing educators on a peer basis, this program will help minority principals and superintendents achieve personal and professional goals that will better their schools and surrounding communities,” Mr. Coleman added. “Goodwin believes that educational success is best brought about by creative networking and problem solving of educators at all levels,” added Ms. Leonard.